Every day, email users are bombarded with 121 emails on average. Email can be one of the most effective forms of marketing. However, to reap the benefits of it, advertisers must cut through the clutter of the inbox. With nearly 69 percent of businesses investing in this channel, it’s important to stand out among the droves of messages. Here are seven tips and tricks to help your next email campaign avoid the trash folder. Be relevant: Timeliness and personalization are important in email marketing. Every day, 269 billion emails are sent and received worldwide, resulting in cluttered inboxes and overlooked emails. To have a strong impact, emails need to be delivered to the right person at the right time with relevant information. Be smart with timing. For example, sending deals for wine on Tuesday will drive people to use them while preparing for Wine Wednesday. It’s all in the timing to keep emails relevant and top of mind to consumers. Personalize: Consumers are looking for information geared toward them and their interests. Use data points to gain a better understanding of your target audience. Consider adding a personalized subject line to further enhance a customer’s experience. People are 26 percent more likely to open emails with personalization. Design with the platform in mind: It’s important to remain consistent across all channels. Roughly 53 percent of emails are opened on mobile devices. It’s vital that all assets are viewable across devices. Viewability helps make emails easier to access and quicker to digest for a consumer. Cohesive messaging: Along with visual consistency, cohesive messaging is important. Cohesive messaging is having the same look and feel to establish brand prominence across all advertising channels. It helps advertisements become memorable, which, in turn, helps improve effectiveness. People need to see an advertisement seven times or more before they take action. Emails and ads with consistent visuals and messaging will help aid in driving action. Set the appropriate budget: According to VentureBeat, on average, for every $1 spent on email marketing, a $38 in ROI is generated. Keep this in mind when setting a budget. 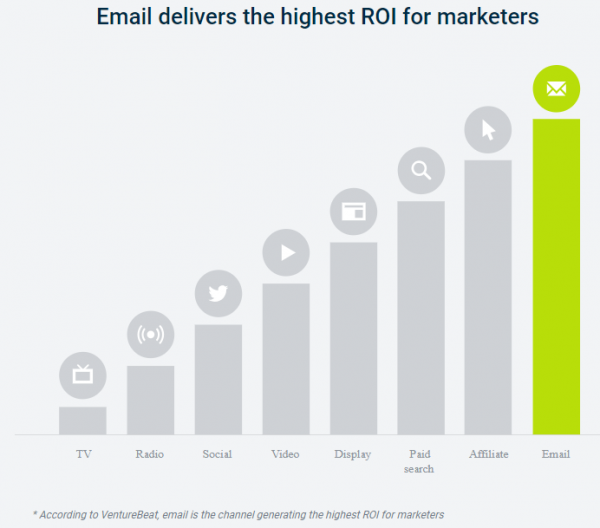 It might be worth it to invest more in email marketing. Tell a story: Storytelling is a vital part of any marketing campaign, and is especially important in email marketing. Use storytelling to introduce your product or service in a creative way. Consider the overall look and feel of the email, and include images, bold design and clear fonts to help craft a crystal-clear story. A good story will compel people to click through to your content or look for more information rather than deleting. Think outside of the box: Be creative! Use interactive elements to push your story further. However, don’t make the email overwhelming with images and paragraphs. Sometimes, simple works best. For some email marketing creative inspiration, take a look at the ingenuity of Ryan Reynolds’ out-of-office emails. Now that you have some fresh email ideas, give email marketing a whirl. You may just be pleasantly surprised with the results.